What’s the fastest way to repair concrete flooring? • Kwik-Bond is already pre-mixed and, once used, will be ready for traffic in less than 1 hour. It repairs holes, cracks, and large areas with spalling. You don’t need any heat or to shut down coolers or freezers. You can use it in meat and poultry plants and other food processing facilities because it is USDA approved. 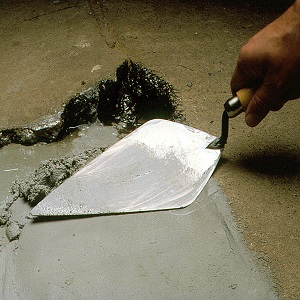 • Kwik-Crete is also a good product to use for very rapid settings when you need industrial strength concrete repair. It can be ready in 8-12 minutes for fork lifts. It meets USDA and FDA requirements. You can use it from -35° F to 130° F. There’s several uses for Kwik-Crete. • Kwik-Flex is also a good product for low temperatures. It is designed for a quick set with a curing time of 12 min. and 45 min. in two set times available. It cures for a high strength seal within 60 minutes. It’s mainly used to repair expansion and slip joints, and can also be used as a crack filler. What does your flexible joint & crack sealant protect against? We have 2 types of flexible joint & crack sealants for commercial use. Poly Flex is made of 100% solids and no solvents. It protects against damage caused by wheeled traffic and stress vibrations. Its original design is as a filler and sealer used in expansion joints and narrow masonry grooves. You can also use it for joints and grooves to protect against damage from water, corrosive materials, and dirt. Kwik-Flex is an expansion joint crack repair product that is used in low temperature areas and provides a quick set in under an hour. It can be used in areas at negative 60 degrees. What do your concrete coatings look like? You can decide which texture to choose from. Our Repox-FC and Repox-HB concrete floor coatings have a high gloss finish, and our Retrax has a textured finish with non-slip. We can also custom color our coatings. Call us at 631-298-6300 or fill out a contact form online to tell us about your order.